Akron, OH- The 2015 Summit Poll, conducted by the Center for Marketing and Opinion Research, found that there are sharp differences among the generations when asked their most commonly used source of information about local news and entertainment in Summit County. County residents 18 to 44 are almost three times more likely to get their information from the internet than the generation before them, 45 to 64, and ten times more likely than residents age 65 and older. 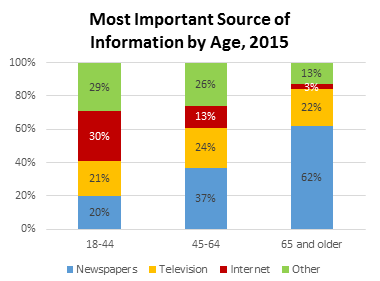 Similarly, residents age 65 and older are more than three times as likely as 18 to 44 year olds to rely on newspapers. 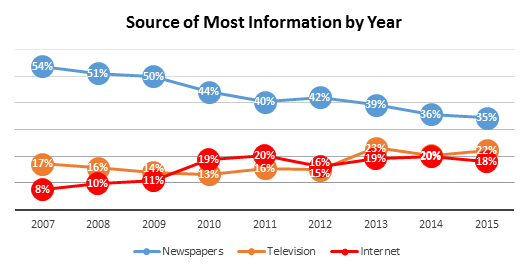 Notwithstanding these generational differences, newspapers continue to be cited as the most commonly used source of information about local news and entertainment among Summit County residents, for the ninth straight year. However, the proportion of residents who rely on newspapers has also declined for the ninth straight year, a drop from 54% in 2007 to 35% in 2015.